271 Beacon is located on the south side of Beacon, between Dartmouth and Exeter, with 269 Beacon to the east and 273 Beacon to the west. 271 Beacon was designed by Peabody and Stearns, architects, and built in 1876-1877 for merchant, cotton manufacturer, and real estate developer Charles William Freeland, for speculative sale, one of six contiguous houses built in the same style: 271-273-275-277 Beacon built ca. 1876 and 279-281 Beacon built in 1881. 271-277 Beacon form a symmetrical group, with the bays of 271-273 Beacon on the west side of each house, and the bays of 275-277 Beacon on the east side of each house. Both 279-281 Beacon have bays on the east side of the house. The original building permit application for 271 Beacon has not been located. The building permit applications for 273 Beacon and for 275-277 Beacon, submitted in 1876, do not indicate the name of the architect. However, the permit applications for 279-281 Beacon, originally submitted in 1877, abandoned, and re-submitted in 1881, indicate that Peabody and Stearns was the architect of these houses, and it is reasonable to assume the earlier four – which are of the same design — also were designed by them (in his Houses of Boston’s Back Bay, Bainbridge Bunting indicates that all six houses were designed by Peabody and Stearns). 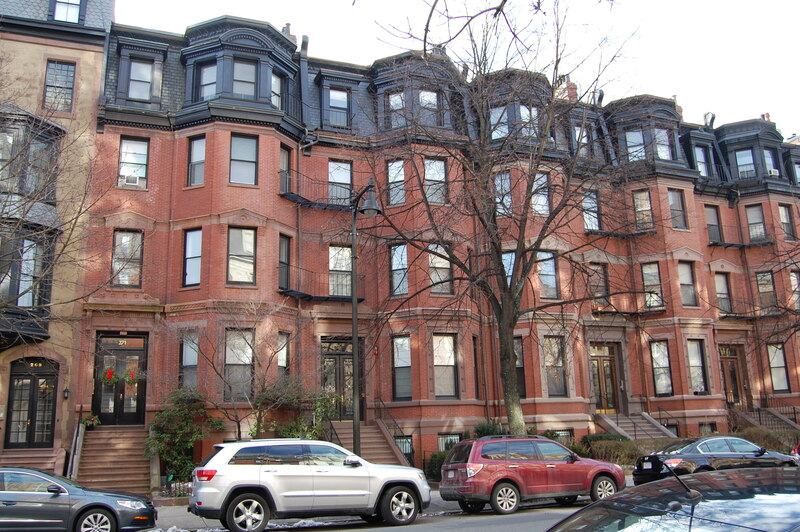 The land on which 271-281 Beacon were built was purchased by Charles W. Freeland from the Commonwealth of Massachusetts in several parcels: Four 25 foot wide lots to the east on May 26, 1874, and a 50 foot wide lot to the west on October 30, 1877. 271 Beacon is 26 feet wide, 273-275-277-279 Beacon are each 25 feet wide, and 281 Beacon is 24 feet wide. Click here for an index to the deeds for 271 Beacon. 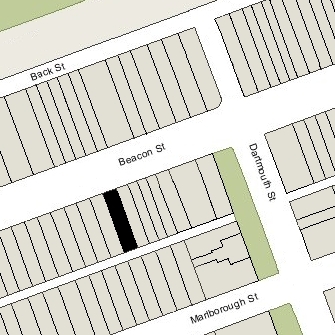 271 Beacon was not listed in the 1876-1881 Blue Books nor does it appear to be listed in the 1880 US Census. On May 20, 1881, 271 Beacon was purchased from Charles Freeland by wool merchant Lemuel Cushing Kimball. He and his wife, Addie (Hall) Kimball, made it their home. They previously had lived at 44 Newbury. On February 21,1909, the house was damaged by fire. Addie Kimball was rescued from her second floor bedroom by the fire department. Addie Kimball died in January of 1916. Lemuel Kimball and their youngest son, Clarence Blake Kimball, continued to live at 271 Beacon. At the time of the 1920 US Census, Clarence Kimball was an automobile salesman. 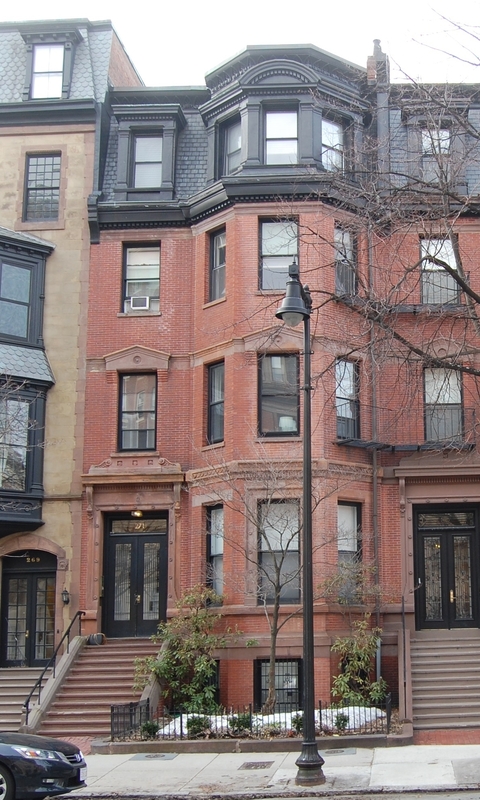 Lemuel and Clarence Kimball continued to live at 271 Beacon in 1924. In March of 1924, Lemuel Kimball married again, to May Bliss Dickinson, a nurse, author, and leader of efforts to promote better health among girls. After their marriage, they lived at the Hotel Lenox at 61 Exeter and then moved to an apartment at 180 Commonwealth. Clarence Kimball moved from 271 Beacon at about the same time, and the house was not listed in the 1926-1928 Blue Books. During the 1928-1929 winter season, 271 Beacon was the home of Dr. Bertha Lulu (Cameron) Guild, a homeopathic physician, the former wife of Chester Guild. She previously had lived at 317 Marlborough. She moved to 8 Batavia by mid-1929. On December 11, 1929, 271 Beacon was acquired from L. Cushing Kimball by Charles H. Hemenway. Two days later, he transferred the property to Ethel G. (Carmichael) Ball, the wife of real estate dealer Edward J. Ball. In December of 1929, Edward Ball filed for (and subsequently received) permission to convert the property into apartments. The application did not indicate the number of units. In his filing, he indicated that the prior use had been as a lodging house. On June 12, 1930, Ethel Ball transferred the property back to Charles Hemenway. The house was shown as vacant in the 1930 City Directory. On July 21, 1931, William H. Brown foreclosed on his mortgage to Charles Hemenway and took possession of the property. In February of 1932, he filed for (and subsequently received) permission to make minor renovations to the interior. His application indicated that the current and proposed occupancy was four apartments. The property changed hands and on May 29, 1952, was purchased by Rebessa (Bessie) Emelyn (Taylor) Elsoffer. the widow of Mortimer Elsoffer. In an affidavit dated June 4, 1953, she stated that the house contained nine apartments at the time she purchased it (two on the basement, first, and second floors, one on the third floor, and two on the fourth floor). She lived in one of the apartments until about 1955. The property changed hands and on September 22,1955, was purchased by Rose Rochelle (Goldberg) Levin Glazer, the former wife of Reuben Levin and of Max L. Glazer. She was a pianist and entertainer who performed under (and legally changed her name to) Rose Rochelle. She owned 273 Beacon, where she lived in one of the apartments. In June of 1957, Rose Rochelle filed for (and subsequently received) permission to legalize the occupancy of 271 Beacon as nine apartments. On July 15, 1957, 271 Beacon was acquired from Rose Rochelle by John Jacques Beaubien. On November 13, 1958, he transferred the property to himself and James Sutherland Ambrose. They lived in one of the apartments. They previously had lived at 279 Beacon. They continued to live at 271 Beacon until 1959, when they moved to 197 Marlborough. The property changed hands and on July 2, 1964, was acquired by John V. Kunigenas. In May of 1966, he was cited for illegally using the property as a dormitory under a lease with Emerson College. He subsequently vacated the building and returned it to its use as a nine unit apartment house. On June 29, 1973, 271 Beacon was purchased form John Kunigenas by Anthony P. Baker, general partner in Bay Associates Limited Partnership, II. On July 7, 1976, John Kunigenas foreclosed on his mortgage to Anthony P. Baker and took back possession of the property. On June 11, 1979, 271 Beacon was purchased from John Kunigenas by the 271 Beacon Realty Corp (Paul G. Roiff, president). 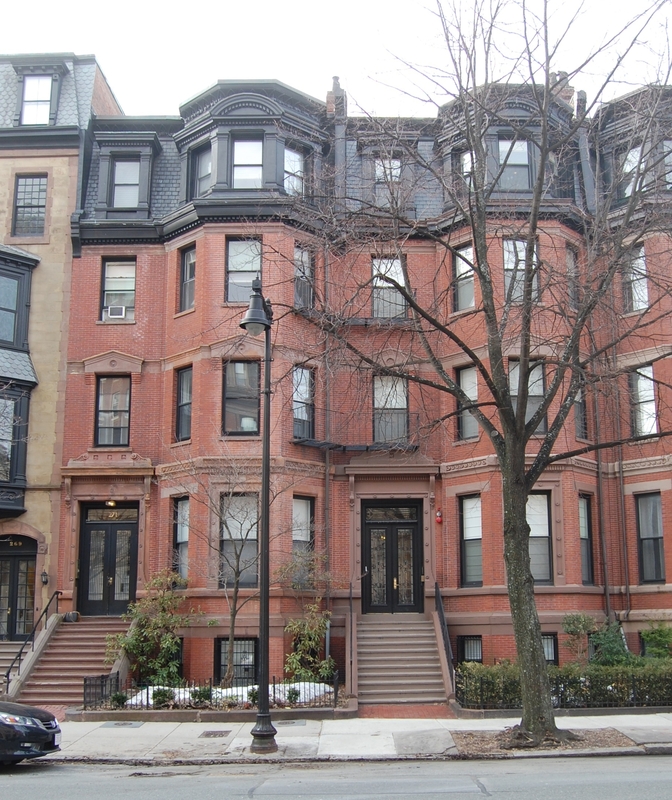 On October 9, 1979, it converted the property into nine condominium units, the 271 Beacon Street Condominium.